We Pay TOP DOLLAR for Silver! Antique Cupboard is a family-owned and operated, Better Business Bureau business that has been in operation over 50 years. During that time, people who have come to us to sell their silver have been consistently bowled over by our service. 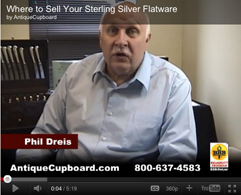 We are recognized as one of the leading buyers of Sterling Silver flatware and hollowware. Selling your Sterling Silver can be fast, safe and simple – we do everything we can to make sure you the process is without surprises. Because we are a silver matching service, we pay more for silver and we do not melt silver! We appreciate that fine pieces and patterns have exceptional value beyond simple silver weight. Why Should I Sell Silver to Antique Cupboard? We are a silver matching service and understand the value of special designs and patterns – we do not melt silver. We will make our offer without requiring you to ship your silver to us before we do so. We have been buying from the public for over 50 years. and other premium makers at a premium price. We do not buy silver plate. Items must be marked "sterling." Nobody Buys Sterling Flatware Like We Do!